Buford Betty: First OB Appointment! Seriously, I hope you are not holding your breath for blog updates because I still have little care or energy to do them right now. Soon though - I'm told - I will! I think the fatigue may be slowly getting better, but I could be imagining that. I still spent the large part of this past Sunday horizontal, so perhaps not. Anyway, we had our first prenatal appointment with my OB yesterday! Besides the appointment itself taking flippin' forever, all went well. I think we are just so spoiled by RBA being so darn quick with everything - they would always get us in and out of there pretty fast. So having to wait several times yesterday between seeing the doctor, the ultrasound, and bloodwork, etc... I was literally gone from my office (including travel time) for four hours. Granted, we did pop by (two floors up) to say hi Dr. T on our way out and had to wait 10 minutes or so to see him - so that didn't help. But yeah, four hours. Needless to say, I was exhausted yesterday afternoon. It's amazing how much a bunch of sitting and waiting and anticipating can wear a girl out! 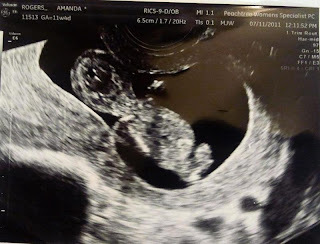 I wasn't expecting to do another ultrasound yesterday, so that was a fun surprise. It was a totally bizarre experience though. Now, I've had literally around 30 transvaginal ultrasounds over the years. I mean, it is like shaking my hand. No big whoop. I know the drill. But they've all been at RBA, so I was just used to how they did them. So maybe how my OB does them is normal, but I thought this was totally weird. First of all, I didn't have a private room to change in and the ultrasound tech didn't leave the room for me to drop my drawers. OK, kinda awkward but whatever. Then once I had my feet up in the stirrups, she handed ME the wand to insert myself. OK, what?!?!?! Then she took over once I put it in. OK is it just me or is that totally weird? Is there some legal reason for this or something? I mean even at an OB/GYN's office they're constantly sticking things up in your girly parts without assistance. Why not this wand? I am still totally weirded out by it. I don't like to see what's going on down there. Just do your thing under the paper gown and let me be. WEIRD. Aside from the strange start, the sonogram was of course fun to see. Our little nut measured 4.91cm crown to rump and was moving around in there like crazy. We have no reason for it, but we both think it's a girl. So perhaps she'll be a dancer like her momma. And go on SYTYCD Season 24. I totally won't be disappointed if it's a boy though. At this point we'd take a hermaphrodite alien with eight legs. The tech also did the over-the-belly ultrasound (I'm sure that's the technical lingo) to try and get a decent profile pic, but our little bug wasn't cooperating. The pics aren't nearly as clear as the transvaginal ones - at least not this early. So... my doctor was of course excited to see me finally knocked up. (She's the one who did all my initial why-am-I-not-getting-pregnant bloodwork and referred me to Dr. T.) She agreed that we'll do a planned C-section at 39 weeks. I like plans. She also referred me to a group of perinatologists (high-risk pregnancy docs), so my next appointment will be with them in two weeks for my 12 week screening. Then I'll be back at my OB another week after that. Sounds like I'll be seeing someone at least every 4 weeks - I'm not sure yet what kind of schedule the perinatologist will have for me. At 28 weeks, I'll start seeing my OB every 2 weeks, and then every week starting at 36 weeks. Lots to process... I guess this is really happening, huh? Glad to hear you had another good appointment!! That ultrasound situation sounds so odd! At mine they leave the room to get undressed and return once you're seated and covered. And they do all the wand stuff themselves.. I would be so shocked if they handed it to me instead? So strange! I've never heard of that before. Hope your energy is back to normal very very soon!! The whole wand thing is super weird. I'd rather let the professionals handle it than feel like I'm putting on some type of show. Hopefully next time isn't as awkward! girl, that IS weird. i've had tons of the transvaginal US too and i have always changed in another room and she did all the work herself. maybe *she's* not comfortable. who knows. you know, we found out what mary margaret was at that 12-wk US. (I was 12w6d) good luck! Congrats on another great appointment!! I won't hold my breath for posts...but that doesn't mean I won't be looking forward to them! And the wand thing...totally weird. Glad all is going well! When I had transvag ultrasounds at the beginning of my pregnancy, I was left alone to get my pants off and cover myself with the paper sheet before the Dr. came in. I also did not have to insert the wand myself. I find it weird that you had to, but I guess every office is different? I was convinced I was having a girl, but I had a boy :) I can't wait to see if your hunch is right or not! Okay your ultrasound sounds super weird! I'm still having to adjust to the fact that our regular OB does abdominal ultrasounds because I'm so used to the vaginal ones! Are you doing the first/second trimester screening? You'll get another ultrasound for that one! It's not as fun though because the fetus has to be in the perfect position for measuring so you end up getting poked and proded A LOT until he moves into place! Ouch! I hear you on the exhaustion. I'm just getting to the point where the idea of anything other than sleep is appealing! I'm hoping my new yoga classes help rejuvinate me a bit! Glad to hear everything is still going well! Congratulations! If you don't mind me asking, why are you being referred to a high risk dr? I'm about 10 weeks after suffering four miscarriages, and I'm graduating from the RE next week if all goes well. I've been wondering if I need to see a high risk dr as well. BBH - I'm seeing one since I've had so many surgeries on my uterus. There can be some complications with that, so that is the main reason! And um...that story is very weird! I feel like you should get a discount for doing her job or something. Very strange! I'm with you on the wand experience - whack-a-doodle for sure. Thanks Betty for taking me along on your travels. I am very excited for you and the hubs! When I had my very first ultrasound I was offered to do it myself, but declined saying "I think you know what you're doing" Glad you got to see your little cutie again though! that seems really odd...definitely now how they do it at my OB. and if they did i'd probably look at them like they're crazy!! I'm with you, about the "insert the wand yourself". I have never had that happen until I went to Gyno out of town. It was very weird! It IS happening! O.k. I have no experience in the baby world but I can say from just my own GYN experience and other friends who have kids that does sound weird! Maybe ask/tell the tech you're not comfortable doing that. Odd. Your OB story made me laugh. That is so odd. I'm left in the room alone to undress, but never--NEVER--have I had to insert the "joystick" on my own. Joystick is my husband's word for it--he about died when he attended my first ultrasound. What a beautiful picture of your little one. Congratulations on a great appointment! The joy your are feeling is contagious and I'm so glad we can all share this with you. Woo hoo!! Love!! (and yes, RBA so spoils us...the waiting at the "normal doc" is just ridiculous!!) And SO fun that you got to go see Dr. T - you'll have to do that often this pregnancy!! So thrilled for you my friend! OK, the wand thing sounds vaguely familiar. Might have happened to me once too. Only thing I can figure is maybe they think it will make women feel more comfortable if they stick it in themselves? Maybe she had a chick kick her before or something when she was inserting it? Ha! They've asked me to insert it myself, which I thought was odd. However, I figured it was even odder for her to try and poke around to get to the right spot. I'll leave that alone.